Fly and shoot enemies with your gun, throw bombs and activate special ability to destroy them once for all. 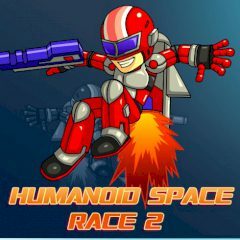 This space race is deadly and you must complete a journey without taking too much damage. Use arrow keys to move your character and space bar to jump and keep your hero in the air.